The Caucuses In 5 Headlines: Donald Trump Dominates In Nevada : The Two-Way At one caucus, "just four people took the stage, including former Virginia Attorney General Ken Cuccinelli, who drew a chorus of boos when he announced his support for Ted Cruz," a newspaper reports. Voters line up outside a Republican caucus site in Las Vegas on Tuesday, a day that was won handily by Donald Trump. It didn't take long for the results of the Nevada Republican caucuses to become apparent: Donald Trump had nearly double the support of his closest rival, Marco Rubio, in the state, where GOP officials are reporting voter turnout that far exceeds recent contests. As NPR's Jessica Taylor writes, it's Trump's "third victory in two weeks and a huge surge of momentum heading into Super Tuesday." Here are five headlines that describe the current scene — three from Nevada newspapers that focus on the caucuses, and two from elsewhere that look at the broader picture and what (might be) next. "For Gary McKuin, Tuesday night would be quick. He planned to vote for Trump and immediately go to the candidate's watch party at Treasure Island. "Jack and Jackie Smith planned a slower exit. It was their first caucus. The Rubio supporters wanted to see how the process worked, and maybe even speak on behalf of their candidate. "In the end, the Smiths didn't speak. Just four people took the stage, including former Virginia Attorney General Ken Cuccinelli, who drew a chorus of boos when he announced his support for Ted Cruz." "Ted Cruz, who held a last-minute rally in the Brewery Arts Center just before the caucuses began, won only 468 votes from caucus goers at the Carson Nugget and Fuji Park. Trump won in all but one precinct where he and Rubio tied at 35 votes. Dr. Ben Carson came in fourth with 208 votes and Ohio Gov. John Kasich fifth with just 102 votes. 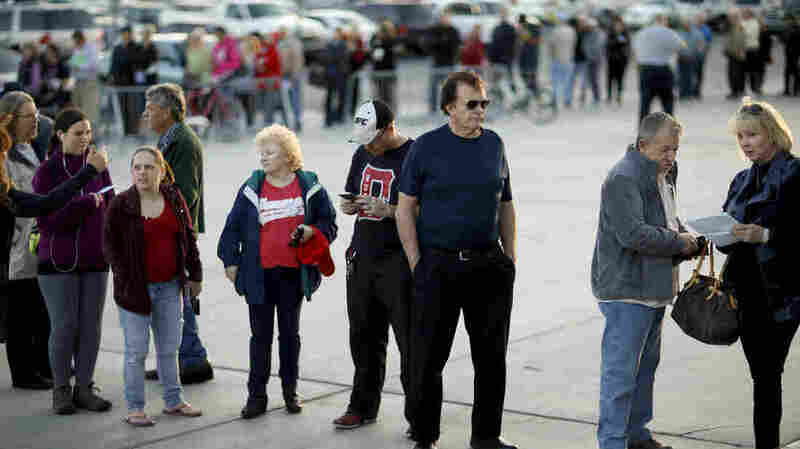 "Altogether, 2,448 people attended and voted. Four were ruled ineligible as they cast ballots for Rand Paul, who has withdrawn from the race. "More than double the number of Carson City Republicans turned out as did four years ago when just about 800 caucused." "Trump won virtually every demographic according to entrance polls, which also showed an electorate very angry with the government, more so than Iowa, New Hampshire and South Carolina. Six in ten Republican voters identified themselves in entrance polls as angry at the way the federal government was going. Roughly the same amount said they wanted an "outsider" as opposed to someone with experience. "Cruz's apparent third-place finish could be a sign of a flailing campaign," [Republican consultant Greg Ferraro] said. "The campaign put a lot of resources into Nevada, including a tour of rural counties by Attorney General Adam Laxalt and a massive effort in advertising." "As Donald Trump picks up momentum, the chances of a well-funded assault to block him from the Republican presidential nomination are dramatically dwindling, according to interviews with about a dozen donors and operatives who are appalled by the billionaire real estate showman's campaign. "The party's elite donor class has mostly closed its checkbooks to groups dedicated to stopping Trump, while the outfits that have built massive reserves are increasingly deciding to forgo anti-Trump campaigns, despite widespread fears that he is making a mockery of conservatism and could undermine Republicans up and down the ballot." "How Trump is beaten: The Republican Party apparatus has picked its candidate, and consolidated support allows Rubio to pull ahead while Trump never breaks past 30-40%. Maybe the Floridian forces Kasich out of the race - either by promising him the vice-president spot or by appealing to his civic responsibility. "It takes Rubio a while to start winning primaries, but when he does the victories snowball into a wave that carries the senator to the nomination. "Why it does not happen: The establishment field is still somewhat fractured. "John Kasich seems stubbornly determined to stay in the race, and Ted Cruz likely pulls away some anti-Trump support that could be Rubio's."